Hey y'all! I have a fun guest post from my friend Stephanie over at Plain Chicken. Stephanie and I met several years ago at a blogging conference and have been friends ever since. When she is not in the kitchen whipping up something delicious or cheering on her favorite team, she is snuggling up with her kitties. Please give her a warm welcome. Hello everyone! My name is Stephanie, and I blog at PlainChicken.com. I like to say Plain Chicken is anything BUT plain chicken! I make quick and easy recipes, most of which are ready in under 30 minutes. I am super excited to share a super quick and easy recipe with you today! 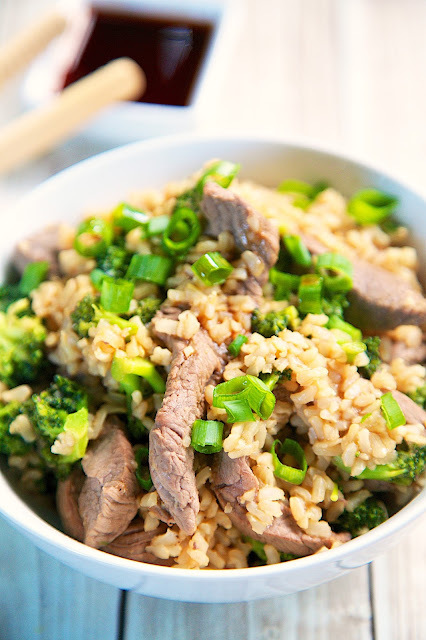 This recipe for Broccoli Beef with Brown Rice has all our favorite ingredients - steak, broccoli and brown rice. This dish is super easy to prepare, tastes great and its pretty healthy too. 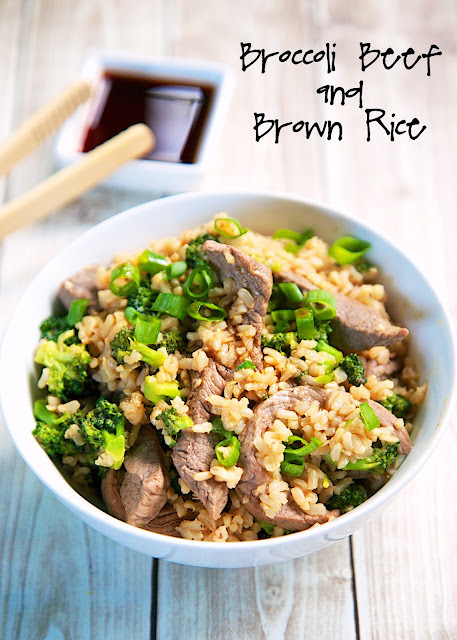 This dish uses instant brown rice. If you haven't used brown rice before, it takes longer to cook than regular white rice, so I started it first. You can also make it ahead of time and refrigerate it until you are ready to make this dish. Once the rice was started, I quickly cooked the broccoli for a couple of minutes. I bought a sirloin steak from the grocery store and had the butcher slice it up for me. That saved me time and cleanup. I browned the steak and then tossed the broccoli and rice in the skillet. Dinner was ready in about 15 minutes. SO easy! My husband and I both loved this dish. There was plenty for us to have leftovers for lunch. It tasted great reheated. We will definitely be making this again! While rice is cooking, blanch broccoli. Drain and set aside. In a large skillet, saute steak until browned. Add the garlic, green onion, soy sauce and broccoli. Cook for 1-2 minutes. Add cooked rice to skillet and toss to combine. Thanks Stephanie for sharing such a delicious dish with all of us. I can't wait to get in the kitchen and whip this one up for the family.